Spring is well and truly upon us – as I write this sitting in the yard, the sun shines brightly, birds chirp all around, bees hum amongst freshly sprouted flowers, and … my asthma is getting worse! But this blog is about a different kind of SPRING that is also making its way into our lives, or more specifically to a network near us. I’m talking about Source Packet Routing In NetworkinG (SPRING) which is how the IETF describes Segment Routing (yes, the acronym is a bit forced, but still appreciated – engineers get excited about these things!). You haven’t heard about it, but my guess is that you soon will. Perhaps it will never become a household term like ‘cloud,’ and ‘analytics,’ and ‘SDN/NFV.’ And perhaps that is a good thing, given how overused and abused those terms have become. But network operators and networking engineers are quietly excited about SPRING possibilities and are talking about it. The recent MPLS & SDN World Congress devoted an entire session to it, and judging by some of the talks there, it is clear that the use cases are quite varied. Folks are not just talking about the technology being applied in core networks, but also in home, access, and CDN networks; in mobile RAN & backhaul networks; and, increasingly, for Service Function Chaining in data-center networks. So what is Segment Routing (SR)? There’s really 3 things you need to know to understand SPRING. First and foremost, its source routing, the path that packets take through the network, is completely determined at the source (router, host, VM). Yes, the source routing paradigm has been around forever, but it’s never been easy to use, nor popular. Until now. 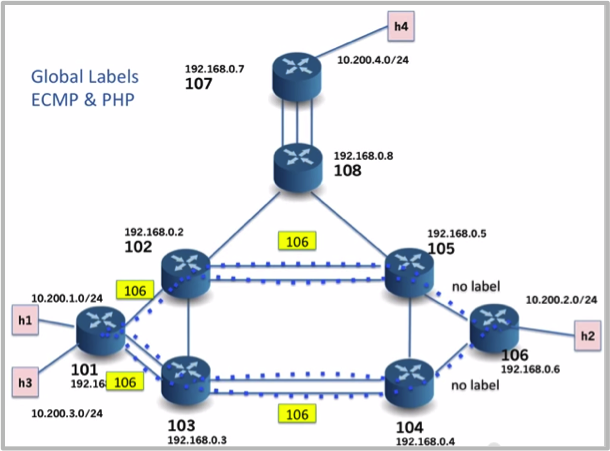 SR defines the path through the network via an ordered set of MPLS labels imposed on the packet at the source^. Second, SR introduces global labels. Folks who know traditional MPLS will appreciate that this simple act has far reaching consequences in simplifying the operation, maintenance and troubleshooting of MPLS networks. And finally, it eliminates complex, label-distribution protocols like LDP and RSVP, further simplifying network operation. I had called for such network simplification a few years ago. If you are looking to explore further, I’ve found this presentation (from the SR inventor) particularly useful. And there is a wealth of information here. In many ways, the excitement around SR stems from the fact that it makes MPLS, traditionally a WAN-core-network technology, more accessible. It leverages the elegance and flexibility of the MPLS label stack, without the complexity of the traditional MPLS control plane protocols. It is easy to see that this is the way MPLS should have been designed from the very beginning! But why is ONF talking about SR? Because it’s about time – in keeping with the conscious effort ONF is making to shift to software, and not pdf-defined-networking, ONF last year sponsored its first major project, SPRING-OPEN, a multi-organization, six-month effort to produce an open source SR prototype using SDN, OpenFlow 1.3, and bare-metal hardware. As project lead, I worked closely with Dell and ON.Lab teams to build the SPRING-OPEN prototype with Dell’s Open Networking hardware talking to ON.Lab’s Open Network Operating System (ONOS) controller. When ONF’s CTO council conceived the project, their goal was to create an open source artifact that demonstrates the scale of OpenFlow 1.3 on hardware that exists today – but that is a story for another day. What we also ended up showing was that it was so easy to create a working, feature-full, IP/MPLS network on bare-metal hardware using SDN and SR principles. Thanks to the rise of merchant-silicon and white/brite-boxes, the MPLS data plane, which previously could only be found on high-end routers from traditional vendors, is now accessible in 1 RU datacenter ToR boxes that cost less than $5k. And thanks to SDN and SR, the control of these boxes is powerfully simple. Such ease, both in the data and control planes, was unthinkable just a few years ago! Our work has attracted a lot of attention. Operators like Bell Canada, Tencent, Microsoft, and China Mobile have tried out our prototype in their labs (and you can too). 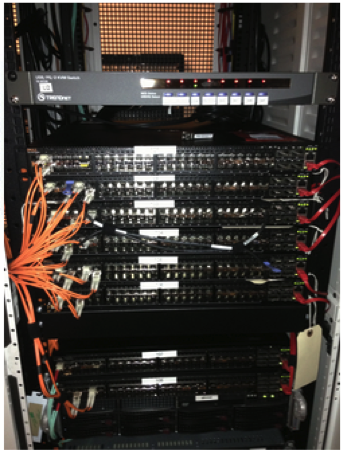 I have personally presented this work to vendors like Ciena, Ericsson, and Cisco. And ON.Lab and Dell are carrying this work forward by working with AT&T to build a segment-routed, leaf-spine L3 Clos network, as part of the latter’s efforts to reinvent their Central Offices as data centers. A sign of things to come, indeed. ^ SR functionality can also be implemented using IPv6 extension headers.